During 2006, European Space Agency, ESA, planned to launch a sophisticated meteorological and environmental research satellite on the Russian rocket into a high-inclination orbit from Baikonur Cosmodrome in Kazakhstan. It was supposed to be the second mission of the Soyuz-2-1a rocket, but, at the same time, the first launch of the new rocket from Baikonur. In addition, for the first time, the Soyuz-2 would be equipped with an enlarged payload fairing and the Fregat upper stage. Originally, there were reports that the second mission of the Soyuz-2-1a rocket (this time equipped with the Fregat upper stage) would carry another dummy payload, from Plesetsk. As of beginning of 2006, such mission was expected in the third quarter of the same year, however it was superceded in the flight manifest by the mission to deliver the Metop satellite from Baikonur. The large size and the weight of Metop required the use of a large payload fairing, developed for the Soyuz-ST rocket, designed for commercial missions from Kourou, French Guiana. Also, the installation of the propulsion system on the third stage had to be modified to compensate for unusual center of gravity of the payload. The vehicle was to follow an unusual trajectory extending northwest, while absolute majority of missions from Baikonur head east and northeast. This flight path would inject the satellite into the so-called sun-synchronous polar orbit with the altitude of 820 kilometers and inclination 98.72 degrees toward the Equator some 68 minutes after the launch. Extending from north pole to the south pole, such orbit would enable the Metop to observe practically any location on the Earth surface during morning hours local time. In January 2006, officials in Baikonur said that the Soyuz-2-1a rocket would carry ESA'a Metop. 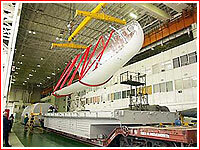 At the time, the work was taking place to prepare processing facilities at Site 31 for the Soyuz-2-1a rocket, while the launch was scheduled for June 30, 2006. On January 30, the Soyuz-2-1a with the ST-type fairing was rolled out to the launch pad at Site 31 for a series of tests. The integration of a 4,193-kilogram Metop spacecraft and its Fregat upper stage started in Baikonur on July 5, 2006 in the clean room of Site 112. At the time, the launch was scheduled for July 17, 2006. The launch vehicle was rolled out to the launch pad at Site 31 on July 14, 2006 at 06:35 Moscow Time. The vehicle was installed on the pad at 08:45. Originally, the launch of the Soyuz-2-1a rocket with the Metop satellite was scheduled for July 17, 2006, at 20:28:10 Moscow Summer Time (16:28 UTC). However one hour 36 minutes before scheduled liftoff, the flight control system of the Soyuz-2 interrupted launch sequence upon detecting an error in setting up the vehicle's navigation. During the night, the problem was identified and reproduced on the test bench of NPO Avtomatika in Ekaterinburg and necessary corrections were made in the flight control system, Roskosmos said. The new attempt was made on a backup date of July 18, however this time flight control system detected an anomaly in the pneumatic hardware of the rocket, soon after the process of refilling of the rocket's propellant tanks had started. As a result, State Commission overseeing the launch made a decision to drain the propellant from the vehicle and analyze the possibility of another launch attempt on July 19, 2006. On July 20, Igor Panarin, an official representative of the Russian space agency, Roskosmos, told Interfax news agency that the Metop launch would be delayed by no less than two months. According to Panarin, errors in the mathematical processing of the launch were discovered. According to Eumetsat, the problem was in the ground support system. Apparently, the command for the purging of the launch vehicle's turbo pumps was not received by the rocket, triggering automatic abort. On July 21, the Soyuz-2-1a was removed from the launch pad and returned to the processing building at Site 31. The payload section along with the third stage was to be separated from the rest of the launch vehicle and then from the third stage as well, in order to be transported to Site 112 for storage. In the meantime, there were reports that three booster stages of the Soyuz-2-1a rocket would be shipped back to its manufacturer TsSKB Progress in Samara for inspections and cleaning required after removing of the rocket from the launch pad. On August 7, 2006, European Space Agency, ESA, announced that during the previous week, meetings between ESA, EUMETSAT, CNES, NOAA and Starsem set the new launch attempt for the Metop satellite for October, 7, 2006. The processing work was jump-started in Baikonur on August 31, 2006. NPO Lavochkin's personnel detached Fregat upper stage from the satellite transferred it to the Hall I of the assembly building at Site 112 to remove its thermal protective layers in order to re-test onboard avionics. Sometime at the end of September or beginning of October 2006, ESA made a request to postpone the launch from October 7, 2006, to October 10-11 and then to the 12 of October 2006, for extra checks of the spacecraft. On Tuesday, October 17, 2006, the launch of the Soyuz-2-1a rocket from Baikonur's Site 31 was scrubbed due to a technical glitch only two minutes before a scheduled liftoff at 20:28 Moscow Time. However the same night, a new launch attempt was set for a backup date of October 18, 2006, at 20:28:13 Moscow Time. The launch countdown was stopped by a control system, after it failed to confirm the pressurization of the oxygen tank onboard the 3rd stage of the launch vehicle, according to the official statement by Roskosmos released on October 18, 2006. The pressurization of the oxygen tank was scheduled to take place at two minutes 30 seconds before the liftoff, however despite the launch operations were discontinued at that point, the countdown clock at the flight control center went on until 20 seconds before launch, resulting in erroneous reports about the scrub at T-20 seconds. 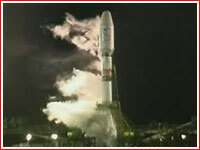 After an analysis of the situation and additional checks, the launch personnel fixed the problem, Roskosmos said. The latest launch took place 24 hours after it was scrubbed for the fifth time. Planned for Wednesday, October 18, 2006, it was postponed due to bad weather, according to Starsem. The payload operator Eumetsat announced that likely presence of strong winds at high altitude led to the decision to cancel the countdown Wednesday. The Soyuz-2-1a rocket, carrying Europe's MetOp meteorological satellite lifted off on October 19, 2006, at 20:28 Moscow Time, (16:28 GMT, 12:28 p.m. EDT). Minutes after the launch, European space officials confirmed the nominal cutoff of the third stage and the separation of the payload section, known by Russian abbreviation as KGCh. At 22:17 Moscow Time (18:17 GMT, 2:17 p.m. EDT) Jean-Yves Le Gall, Chairman and CEO of Starsem, a Russian-European joint venture, which markets the Soyuz family of rockets, declared the launch a success.